I am going to describe to you how this grand old building can speak to us about the past using symbols. Some of these symbols are still easily readable others are less so and some we have perhaps lost the meaning of in the 182 years since the church was built. This church was built in 1835 for the congregation and it cost £2,230. The building reflects the period of time after the law, making it penal and a blasphemy to deny the Trinity, was abolished in 1813. The task of making a building which satisfied everybody’s requirements is a hard one as we did just finding a carpet for the upper hall which was acceptable to the majority! Firstly, churches are usually ‘oriented’. That literally means ‘facing the orient’ or East. If you think about St John’s round the corner, it has its altar and pulpit at the Eastern end. Our church, although it does not have an altar as such faces near enough West. What does this tell us? Perhaps that the architect was allowed or even encouraged to build it with this previously unthinkable orientation. Already you are looking at this old building in a different light. As you can see the gallery is supported by two types of columns, the type called ‘Doric’, quite plain, and the so-called ‘Corinthian’. 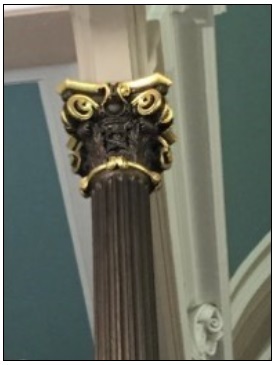 The Corinthian columns have a very decorative capital (the top bit) and are fluted - they have grooves running up and down. These are meant to convey a deep knowledge of history and ancient civilisations. The fluting is inspired by the ancient Egyptian practice of representing everyday practical objects in stone. Some Egyptian columns are thought to represent bundles of papyrus, as used as supports in humble dwellings of the period. Above us in the gallery between the pillars are little plaster flourishes properly called cartouches which contain the letters IHS. This motif is also repeated on the pulpit cover or sounding board. The Christogram IHS is a monogram being a symbol of Jesus Christ in form of acronym. From Greek it is an abbreviation of the name IHΣΟΥΣ (Jesus).IHS appears on the coat of arms of Pope Francis. The ‘S’ shaped bracket, called a corbel supports the overhang of the balcony - or it may simply be decorative. It looks very similar to corbels I have seen in other parts of the city. It was probably a very standard piece in the kit of parts for architects in the 1830s. However, what struck me most about it is that it looks like a crocodile with its teeth in sideways! On the top of the frontage to St Mark’s are six decorative urns. Urns are meant as memento mori. They remind us that we are mortal. The urns you can see are quite strange in that they have a very pointed cover with clamps holding it in place. There are exact replicas, gilded, on the sounding board over the pulpit. I was quite disappointed when I looked closely because until then I had believed them to be tiny golden elephants on their hind legs raising their little trunks to heaven. Most of you will know this but for those that do not. A flame within a chalice (a cup with a stem and foot) is a primary symbol of the Unitarian Universalist faith tradition. Many of our congregations light a flaming chalice in gatherings and worships and feature the chalice symbol prominently. Hans Deutsch, an Austrian artist, first brought together the chalice and the flame as a Unitarian symbol during his work with the Unitarian Service Committee during World War II. To Deutsch, the image had connotations of sacrifice and love. Unitarians today have many different interpretations of the flaming chalice, including the light of reason, the warmth of community, and the flame of hope. (taken from the UUA Website). The sounding board above the pulpit, is designed to reflect the sound of a preacher’s voice towards the congregation. It is octagonal. It has eight sides. Apparently now demolished chapel in Paradise Street in Liverpool which was the living of one James Martineau was octagonal. The Octagon Chapel in Norwich, one of our most architecturally important Unitarian Chapels, is of course octagonal. Why did the original architects of the church include the eight-sided shapes? Were they leaving us a message in the structure of the building? The Dome of the Rock in Jerusalem is an ancient temple in the form of an Octagon surmounted by a golden dome. It dates from about the 7th Century and presents the first example of the Islamic world-view. The very site where it was established, the structure of the building, its dimensions and proportions, its external outline, are all representative of the faith that inspired its construction. from the sundial which cast the sun’s shadow (always problematic in this country) which itself evolved from a stick in the ground casting its shadow. The dial with pointer has evolved into a more general device for indicating for example the temperature in your deep fat fryer to the speed of your broadband. Another symbol we take for granted is shown above the door through into our upper hall. The green sign with the stick figure of a person running with an arrow next to it. We can all clearly see that it is telling us that if you run through that door you will fall down the stairs! choice about their appearance. (The Unitarian Heritage, An Architectural Survey: Chapter 7 ‘The Unitarian Chapels of Scotland’ by Rev Andrew Hill). They have a pleasingly coloured surround with little fleur-de-lis and red flowers. I can find no evidence, but I suspect these flowers had some significance to the donor now lost. I did for a while wonder if the red flowers were in fact slices of orange and that there might be a Dundee marmalade connection, but that is perhaps because my surname makes me sensitive to mentions of preserves. The rest of the window is an abstract design - or is it? If you look a bit more closely you will see that the leadwork divides the window into segments and these segments look very much like the display on an electronic calculator. When I look at it, as I sometimes do when my mind wanders as it sometimes does, I see the number eight. If you look again you may be able to see four, six and nine, in fact all the numbers. Calculator displays can also be used to show letters. If you use your imagination you could form words such as PRAY, LOVE, GOOD, JOY, GAIN, FEEL, or if you are really not enjoying the service you may find, HELL, OUCH, FISH and CHIP. Now I suspect that when you look at the window during future services you will find it is making its own comments that may well be relevant. SOON, GONE and NAP. A young visitor recently asked me why there were no religious symbols in the church such as crosses. There are crosses in this Church but you need to know where to look. Look at the window again, at the very top there is a circular window. Is it just a decorative motif or is that a cross with a saltire in the centre? Is the window in fact filled with crosses? You could read the whole window with its stone transom and mullion forming a cross in the centre. So, what does all this amount to? mediator between God and men, the man Jesus Christ’. In 1839 a number of members left the church rather than conform to that affirmation. It was not until 1854 that the constitution was changed to ‘conceded to each other entire freedom in the interpretation of the records of the Christian faith’. Think of the people who have passed through these doors in the last 182 years. A rough calculation gave me nearly 1,000,000 attendances. All that goodwill and love has sort of polished the aura of this place, hasn’t it? All those people have nearly all heard music, listened to the sermons, sung hymns, said prayers, meditated and seen very nearly the same building you see now. They are part of the Unitarians in Edinburgh story as are we. Symbols and their meanings will appear and fade but we have built on the values which our forebears developed. The building is beautiful, but it is in the end just a building, whereas Unitarians in Edinburgh is a long surviving peaceful, caring and tolerant community. This article is an edited version of a longer address given by Roger Hartley. Roger, who is a member of St Mark’s, took the photographs for this article.